A 1978 political poster from Governor John Carlin's first gubernatorial race against Governor Robert Bennett. The poster depicts an overweight gentleman with the slogan "WE HAVE TO PUT KANSAS GOVERNMENT ON A DIET". 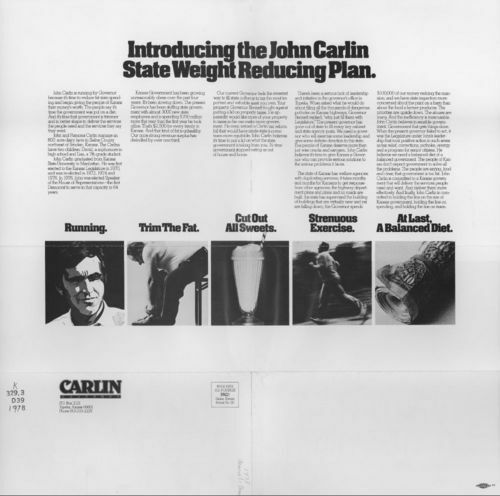 The solution is referred to as "The John Carlin State Weight Reducing Plan". The plan illustrates strategical effective images and political rhetoric that would provide for a balance diet in state government. Carlin's approach to a sensible government, elected him as the fortieth governor of Kansas.